Spinal nerve is any of the nerves that arise in pairs from the spinal cord and form an important part of the peripheral nervous system. The spinal nerves contain both sensory and motor nerve fibers. 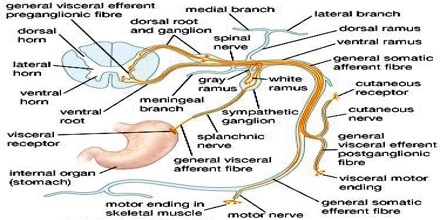 There are 31 pairs of spinal nerves in the human body. These are grouped into the corresponding cervical, thoracic, lumbar, sacral and coccygeal regions of the spine. There are eight pairs of cervical nerves, twelve pairs of thoracic nerves, five pairs of lumbar nerves, five pairs of sacral nerves, and one pair of coccygeal nerves. The spinal nerves are part of the peripheral nervous system. Cervical and thoracic spinal nerves arise and leave at corresponding vertebra. Because the spinal cords are shorter than vertebra column, nerve that arises from lumbar, sacral and coccyx region of spinal cord do not leave the vertebra column at the same level where they exit the cord. The root of these spinal nerves angle inferiorly in the vertebral canal from the end of spinal cord like wisps of hair. In humans there are 31 pairs: 8 cervical, 12 thoracic, 5 lumbar, 5 sacral, and 1 coccygeal. Each pair connects the spinal cord with a specific region of the body. Near the spinal cord each spinal nerve branches into two roots. One, composed of sensory fibres, enters the spinal cord via the dorsal root; its cell bodies lie in a spinal ganglion that is outside the spinal cord. The other, composed of motor fibres, leaves the spinal cord via the ventral root; its cell bodies lie in specific areas of the spinal cord itself. Cervical spinal nerves have 8 Pairs, 1st pair emerge between atlas and occipital bone. The remaining emerges from the vertebral column through intervertebral foramina. Spinal nerves C1 – C7 exits the vertebral canal above their corresponding vertebra. Spinal nerve C8 exits vertebral canal between C7 and T1. 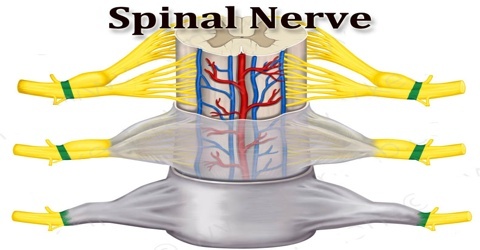 Lumbar spinal nerves have 5 pairs, Emerge from lumbar vertebra. Nerves emerging from a plexus contain fibers from various spinal nerves, which are now carried together to some target location. Major plexuses include the cervical, brachial, lumbar, and sacral plexuses. 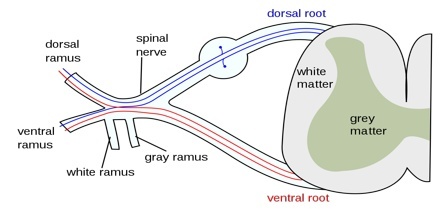 The posterior, or dorsal, roots of spinal nerves carry sensory information from the areas they serve back to the brain. Spine-Health explains that the area of skin from which a particular nerve receives sensory information is known as that nerve’s “dermatome.” The thoracic nerves supply motor function to the muscles of the abdomen and chest, as well as the specific hand muscles that allow an individual to spread his fingers apart. The cervical nerves serve the muscles of the arm and hand. The anterior, or ventral, roots of spinal nerves carry motor impulses from the brain to the muscles, instructing them to move. Damage to a nerve could cause weakness, or even paralysis, in the muscles that it serves. Reference: britannica.com, slideshare.net, livestrong.com, wikipedia.